Child7-12 years old. 6 and under are free. 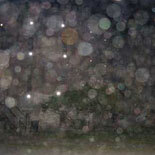 The most disturbing tour in Charleston is the Haunted Jail Tour. This behind the scenes look at the infamous Old City Jail is one of Bulldog's most popular sightseeing excursions. You will hear stories of tragic events, mystery and the macabre as you tour the jail that housed the city's heinous criminals from 1802 until 1939. Prisoners included 19th century buccaneers, Civil War prisoners and horse thieves who lost an ear for their offenses. Hear about people being burned at the stake, branded, drawn and quartered and horse thieves having their ears nailed to a post. Bulldog Tours is committed to preserving America's rich cultural history and important national landmarks. Established in 2001 as part of an effort to preserve the Old Exchange Building, Bulldog has raised over $600,000. The company donates a portion of each admission fee to protect the Exchange, one of the nation's most historic buildings, and other significant landmarks within the Holy City. In 1738, the first buildings constructed on the Charleston site served as a slave workhouse, a hospital for the indigent and the city jail. Punishment for serious offenses included shackling, whipping and starvation. Some inmates were branded, drawn and quartered and burned at the stake. The jailer punished horse thieves by nailing their ear to a pole. Prisoners were released when the jailer severed their ear. The grounds were the site of numerous executions, including the country's first female serial killer. In 1820, Lavinia Fisher and her husband were hanged for poisoning and robbing guests who stayed at their hotel. Many of the original buildings, including the warden's quarters and jail cells, remain intact. Designed to hold 128 prisoners, the number often swelled to more than 300. The cramped conditions, poor sanitation and abuse were ghastly. 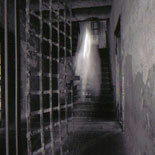 The spirits of the more than 10,000 people who died here have inspired legends and stoked the jail's reputation as one of the most haunted locations within the city. During the tour, you will hear horrifying tales as well as view the cells and hallways where Charleston's worst pirates, murderers and thieves lived and died. 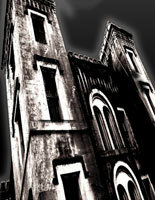 An experienced guide will provide insights into the stories, legends and history of the city's dark side. 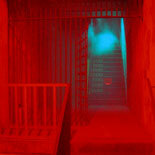 Obtain an eTicket today to experience the scary and entertaining 45-minute Haunted Jail Tour. Tours: 7 pm, 8 pm, 9 pm & 10 pm Nightly. Please call for availability. The number will be on your eTicket. Times are subject to change. Closed on Christmas Eve and Day. You can either walk or drive the 7 blocks to meet your tour guide at The Jail. Free parking is available at The Old Jail. Child Ticket: 7-12 years old. 6 and under are free. Not recommended for young children. Reservations are required at least 1 day in advance of desired tour date. You can either walk or drive the 7 blocks to meet your tour guide at The Jail. The experience is NOT recommended for small children.